The Half-Day class is aimed particularly at beginners. No previous knowledge is assumed or required. Many participants have just bought their first SLR and often their first camera of any kind! The 1 day workshops also start with the absolute basics before going in to more detail. There is also more time to put everything into practice. The 2 day travel photography also starts with absolute basics. What is the difference between the Half-Day and the 1 day classes? Both half-day and full day versions cover the fundamentals; Controlling movement with Shutter Speeds; Blurring portrait backgrounds by controlling apertures; Avoiding images that are too light or dark by varying exposure; Better Colour by understanding White Balance; Understanding ISO; Lens Choice. The extra time available with the 1 day classes allows more time to practice. We also cover some other valuable subjects: Precise exposure control using Histograms; Benefits of RAW files; Creating a feeling of movement by Panning moving subjects; Better Black &White; Better Portraiture; Bounce Flash and more. Should I do the half-day then 1 day? No, as there would be too much repetition. Some people do do the half-day beginner's class then practice for a few months before doing the 1 day version and enjoy the experience. However you might get a distinct feeling of "déjà vu". I am already an experienced photographer do you have a suitable class? Most of our classes start with absolute basics (some participants will have never held a DSLR before). If you already know quite a lot already you might find the classes too basic. To be frank Photographers sometimes think they know more (or less) than they actually do. If you have more experience check out the Creative Photography Workshop in Sydney. If you are not sure about the level of your knowledge do the <QUIZ> to find out. What do I need to bring to the classes? In addition to your camera and lens(es) don't forget to bring your memory card (4Gb minimum, 8Gb preferably), fully charged camera battery and (if you have it) the instruction manual for your camera. Also bring a pen and paper. A tripod is not required for most classes, we will use a tripod for the night session of the 2 day workshop (we are happy to lend you one FREE of charge). Please remember that the classes take place outdoors so please wear appropriate clothing. Bring warm clothes in winter and bring an umbrella if it looks like showers. There is a small amount of walking so wear comfortable shoes. Also something you can kneel down in. There are limited food options around Hyde Park on weekends so you might want to bring a packed lunch. What type of Camera do I need for the classes? To get the most out of our classes you will need to use a camera with sufficient control.We are happy to loan you a suitable camera FREE of charge. During the class you will learn what you need to consider when buying a camera. If you already have your camera look at the model name (if you still have the box it's sometimes easier to find the model number there). Suitable models: DSLR (Digital Single Lens Reflex) cameras are ideal. All Canon "EOS" Series e.g. EOS 1200D, EOS 700D, EOS 6D etc (and all older EOS models) All Nikon "D" Series e.g. D3300, D5300, D7100 etc (and all older Nikon DSLRs) All Pentax "K" Series e.g. K-3, K-5, K-30, K-r etc. All Olympus "E" Series e.g. E-5, E-450, E-620 etc. All Sony " a" (Alpha) e.g. A3000, A580, A390. Also all SLT-A.. e.g. SLT-A57, SLT-A37 etc. There is a newer style of 'Mirrorless' interchangeable lens cameras which have abandoned prisms and mirrors (the "reflex" in single lens reflex) in favour of electronic finders and screens. These cameras still have large sensors and plenty of control. Suitable models include: All Olympus "Pen" Series e.g. Pen E-PL3, Pen E-P7 etc. OM-D series e.g. E-M1, E-M5, E-M10 etc. All Sony "Nex" Series e.g. NEX-5T, Nex-6, NEX-7. Also Alpha 7 models All Samsung "NX" Series e.g. NX1, NX20, NX200, NX1000, Galaxy NX etc. All Panasonic "G" Series e.g. GM1, GM5, GX7, GH3, G5, GF5 etc. Fujifilm X Series e.g. X-A1, X-M1, X-E2, XQ1, X-T1, X30 etc. Other suitable cameras include various 'Bridge' cameras (often with huge zooms). Suitable models include: Most Panasonic FZ series e.g. FZ60, FZ200, FZ1000, Canon SX60 HS Finally there are a number of suitable 'Compact' models including: Canon 'G' Series e.g. G10, G11, G12, G1 X etc. If your model is not included in the above list, it may still be suitable so call us on 0448848864 and we can let you know. Why is a “point and shoot camera” unsuitable for the classes? Most "Point and Shoot" compact cameras are designed to be very simple to use, however they lack direct control of functions such as shutter speeds and apertures. To get full value out of one of the workshops you really need to use a camera with more control. I would be happy to lend you a suitable camera (a DSLR) if you would like to learn more about digital photography. You may well wish to buy that type of camera after you have done a course. You would still get use out of your present camera for situations where you wanted a smaller camera to carry. Some of the subjects covered by the workshop would also be relevant to your compact cameras. Which Lens (or lenses) should I bring to the class? You can just bring 1 lens if you want to travel light. In which case bring the "standard lens" that you got with the camera e.g. 18-55mm (or you might have a 18-105, 18-135, 18-200 instead)* *Note the numbers above are for most Canon, Nikon, Pentax or Sony DSLR's. (Also the Samsung NX series). If you have an Olympus DSLR or "Pen" series or a Panasonic "G" Series the numbers for the "standard lens" will start at 14mm rather than 18mm. E.g. 14-42mm etc. If you have a so called "Full Frame" camera e.g. Canon 5D mkIII, Canon 6D, Nikon D810, Nikon D610, Sony Alpha 7 bring your 24-70mm, 24-105mm or similar. Of course feel free to bring other lenses that you use often or that you would like to ask about. Can I use my film camera for the classes? Feel free to bring your film SLR with you as much of the class content is equally relevant to film. However to get real value from a class you will need to have access to a DSLR (We are happy to lend you one - subject to availability). Some of the things covered apply only to digital photography. Best to buy camera before or after class? If you have not yet bought a camera you may wish to wait until after you have done a class. We are happy to lend you a DSLR for the class (subject to availability). We will discuss what to look for when buying a camera you will then be in a better position to choose. Because there is a lot of practical during the classes each participant needs to be using a camera on their own. We are happy to lend you a DSLR for the class at no charge - subject to availability. How big a memory card should I bring? You should bring at least an empty 4Gb memory card. If you are about to buy a new card, get at least an 8Gb card as we will be switching to RAW files for the classes which give better quality but take up more space. Can I borrow a Camera? We are happy to lend you a DSLR for the class at no charge - subject to availability. Please let me know in advance. If you want to take the images home with you bring along an SD card (4GB minimum, preferably 8GB). Please Note: Sony Memory Sticks (MS) are NOT suitable - Sony also make standard SD cards which are suitable. When choosing a digital SLR remember the lens is the most important part of any camera. DSLRs come with a variety of lenses of varying quality. If you are working to a budget get the best lens you can afford and then put it on to any camera that will work with it. At the DSLR entry level the Canon 1200D, 700D (or older 650D), Pentax K-30, Nikon D5300 (or older D5200) and Sony SLT-A37 are all terrific cameras and will do a great job as long as you buy them with a decent lens. Remember the lens is the most important part of any camera, unfortunately manufactures sometimes cut corners on "kit" lenses to keep prices down. If you have a bigger budget you might want to look at the Nikon D7100 and the Canon 70D. These "mid-range" models are built to be a bit more robust. Some features that are buried in menus on cheaper models have their own dedicated buttons. Once you have done one of the workshops you may find that it is worth paying the extra for the quick access to some of the more advanced features. There is a newer style of interchangeable lens cameras which have abandoned prisms and mirrors (the "reflex" in single lens reflex) in favour of electronic finders and screens. The designers can now make smaller models with this more direct light path. Importantly these cameras have the same large size sensors as DSLRs. It is a rapidly developing sector of the market and will become more and more important. Interestingly there is still no universally accepted name for this type of camera. Consequently you might see them described as any of the following: EVIL (Electronic Viewfinder Interchangeable Lens) ILC (Interchangeable Lens Camera) MILC (Mirrorless Interchangeable Lens Camera) or just "Mirrorless" CSC (Compact System Camera) Examples of this style of camera include the "Pen" series and the OM-D from Olympus, the Sony "Nex" models, Samsung NX range and the Panasonic "G" series. I strongly recommend getting a camera with a viewfinder. Some models only have the rear screen which can be hard to use in very bright conditions. Also holding the camera out away from the face is not the best way to get sharp images when using slower speeds. What is most important Sensor size or Megapixels? There are many cameras that look like shrunken down DSLRs often with "superzooms". The problem is they have tiny little sensors. On the upside these small sensors do allow for massive zoom ranges which might make them useful "on safari". Unfortunately there are a number of disadvantages. Smaller sensors are inherently more noisy and some pretty heavy-handed noise reduction takes place. This is made worse by having stupidly high megapixels. e.g. 14mp on a sensor smaller than your little fingernail is the insanity of marketing overriding design. Tiny sensors also limit your control of depth of field and restrict the range of small apertures available (a real problem when using longer speeds in bright conditions). DSLRs purchased from authorised Australian dealers have official warranties. Cameras purchased outside of Australia don't usually come with official manufactures' warranties but may come with their own "store warranty". Currently some lens manufactures' warranties are International , so it is relatively safe to buy some brands lenses from overseas suppliers. Check the manufacture's website to be sure. http://www.nikon.com.au/en_AU/service/warranty_policy.page https://www.canon.com.au/en-AU/Business/Support/Warranty/Warranty-Terms http://www.sony.com.au/section/warrantyinfo http://www.olympus.com.au/Support/Service-and-Repairs/Warranty If you go to an Australian camera shop you will have the personal service and backup. The products will have come through the official Australian Importers e.g. Canon Australia, Nikon Australia etc. A good friend of mine Andy Beck works at Digital Camera Warehouse in Canterbury. Andy is great bloke as well as an excellent photographer. DCW prices are VERY competitive and come with Australian warranties. An alternative would be a store like D-D Photographics in North Sydney, they are "parallel importers" who can be cheaper and will offer their own warranty. Online options include DWI, CitiWide and Digital Rev which can be found via eBay. Note that goods shipped from overseas valued at over $1000 may attract GST and a processing fee from Australian Customs. All this is subject to change so check details and confirm warranty conditions before purchasing. Please note that tripods are NOT required for the Half-Day or the Sydney 1 Day Beginner's Workshops. We do use tripods for the night session of the 2 day course and for the Blue Mountains classes. I can lend you one FREE of charge. Advice on choosing a tripod. If you intend doing a lot of landscape photography a good tripod is pretty much essential (especially in low light). I suggest that you buy the heaviest tripod that you are prepared to carry. A flimsy model is really only useful as an extra set of hands to hold the camera as you run around the other side of the camera and say "cheese". On the other side of the coin a tripod is totally useless if it weighs so much that you never take it with you. You can save weight without sacrificing stability by buying a carbon fibre tripod however these are a lot more expensive. I would recommend Manfrotto as a brand. Take a look at the 190, it is solidly made -I have had one for over 25 years and it's still going strong. They are not particularly cheap but if you are going to use a tripod regularly it is a worthwhile investment. Typically classes have 6 to 10 participants. You will get plenty of personal attention. For group bookings we will require a non-refundable deposit of $40 per person. This is due to previous occasions when 1 in a group becomes unavailable and everyone drops out, We are then left with multiple empty places. The deposit is payable via PayPal using your Mastercard or Visa on the PayPal website. The balance can either be paid in advance via PayPal or you can pay cash on the day, whichever is easiest for you. Regarding payment you can do one of the following; 1. Visa or Mastercard. Pay in advance (via PayPal website - no need to register with PayPal) Please note that we cannot take credit cards on the day of the class or over the phone. 2. PayPal. If you are already registered with PayPal you can use the "Send Money" option and send the remittance to enq@andypiggott.com (Please make sure you include your name in the comment field). 3. Pay in advance by "Direct Deposit" - If you choose Direct Deposit our bank account details are: BSB: 112-879 Account No. 056 687 041 Account Name: Andy Piggott Photography 4. Pay Cash on the day. Please note that Gift Certificates can only be paid for via PayPal or Direct Deposit. If you cancel your booking more than 48 hours before a class there is no cancellation fee. Cancellations less than 48 hours but more than 24 hours before a class are subject to a 50% cancellation fee. We are unable to offer refunds (or re-bookings) on cancellations less than 24 hours before classes or for no-shows. If you do reschedule more than once we may ask for a non-refundable deposit. My wife Di and I have moved to the Blue Mountains and now only travel to Sydney on weekends. As my Saturdays and Sundays are dedicated to the workshops I no longer have time to do private lessons in Sydney. Private lessons are available in Katoomba/Leura in the Blue Mountains. Private lessons cost $100 per hour for 1 person. If you want to come as a small group add $25 per hour per person. Who will I be dealing with. Do you run all the classes yourself? This is a 2 person business consisting of me Andy Piggott and my LOVELY wife Di. Your email enquires are answered by Di (with my input as required). All of the classes are conducted by me. Andy, what is your background in photography? My first camera was an Olympus Trip 35 bought 30 years ago which I still have. I have been a professional photographer since 1981. I operated a professional colour darkroom for 8 years specialising in the Cibachrome process. Stepping out of the dark in 1997 I have been staring at photos on monitors for over a decade. I went fully digital in 2003 (though I still remember how to load film 😉 My photographs have been published in Australia, U.K. USA and Asia. They have been featured in photography magazines, airline in-flight magazines, photographic "how to" books, travel brochures, calendars and advertising. Sydney classes usually take place in and around Hyde Park. Sometimes due to "special events" in Hyde Park or prevailing conditions the classes are held in the Botanical Gardens. The Night session of the 2 day workshop is usually at Dawes Point (The Rocks). Blue Mountains courses take place in Katoomba and Leura. Most Sydney Classes meet at the Archibald Fountain in Hyde Park. Please note that some classes meet at other locations e.g. The Rocks, The Opera House etc. In which case you will get the details and location when booking. Sydney Courses Domain Car Park has Flat Rate on Saturdays & Sundays (except special event days). Please note that it does not open until 9a.m. on Sundays. Click here for more details. Enacon Parking in Cathedral St also has good value flat rate parking on the weekends and opens early. Click here for more details. How do I get to the class by Public Transport? 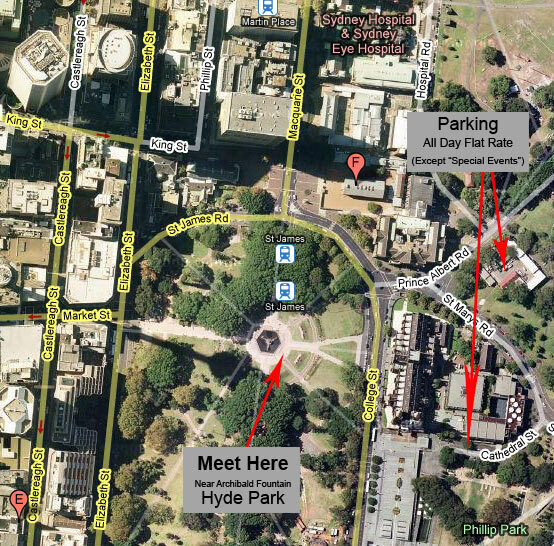 If you are coming to Sydney by train the meeting point for most courses (Archibald Fountain in Hyde Park) is a about 200m from St James station. For our Blue Mountains courses you can catch trains from Sydney's Central Station and get off at Katoomba. I am being picked up after the class, where do we finish? Most Sydney classes usually end at the Park Street end of Hyde Park. Blue Mountains classes will finish in Katoomba near the train station. I want to book a class after the dates shown on the site. Will you be setting more dates? Classes run through most of the year (there are less classes during May, and July and no classes in June due to the colder weather and shorter daylight hours) New classes are added as dates fill. We prefer not to set classes too far ahead because we need to keep the occasional date free to allow rescheduling of rain cancelled classes. Do you do classes during the week? The dates on the site only show weekends. As Di and I now live in the Blue Mountains, we come down to Sydney for the classes only at the weekends. We run a few weekday classes during January. What is the mix of Theory and Practical? The classes are very "hands on". A concept is introduced and explained it is then put in to practice. The next related concept is then introduced and explored. The extra time available for the 1 day classes obviously allows more time to practice. The 2 day workshop includes a couple of sessions in a convention room looking at and discussing images, there is a lot of practical over the 2 days. Do you supply Course notes for the classes? On the day of the class Di sends out an email with links to online revision notes so that when you get home after the class you can do a review of what was covered. You can also print the notes out if you wish. Please bring a pen and paper to make notes during the class. The very act of writing down the information yourself helps re-enforce what you have learned. Towards the end of the class I give you a laminated "Cheat Sheet" for you to keep in your bag as a reminder of the most important subjects covered. Are your Travel Courses only suitable for travel photographers? Both the 1 and 2 day Travel Courses are very hands-on with plenty of time to put the many new techniques and tips you learn in to practice. They are particularly valuable for travel photography but the subjects covered are relevant to all outdoor photography. My background is largely in travel photography so there the courses contain loads of useful tips. Do the classes cover flash photography? The classes that I run are basically outdoor concentrating on available light. During the 1 day workshop we discuss using flash and I will give you tips on bounce flash. If no one is interested in flash photography I sometimes skip it so make sure you let me know that you want me to cover it. Do you offer Night Photography Classes? I no longer do the stand alone night photography classes. The 2 day "travel" workshop finishes with a night photography session. Also for those people who have done the One Day Workshop there is a follow up "One Day Creative Photography Workshop" Workshop available which also finishes off with a night photography session. You may have a small business and want to photograph your range of product for catalogues and your website. Note that the classes that I run are based mainly on outdoor photography. It is possible to do a lot using available light and reflectors. For this you will need to know the fundamentals of photography. The 1 Day Classes give you the basic knowledge required. If you intend to photograph a lot of products and often you will need to work with introduced light (preferably studio flash). The classes I run do NOT cover studio work. Bear in mind that to get a result that looks professional takes a good deal of effort and some extra equipment. Glass and silverware are notoriously difficult. Do you offer Photoshop classes? I used to teach Photoshop but now I concentrate solely on the photography. A couple of people in the industry whose opinion I respect have recommended Thomas Kayser. I have never met him myself but he sounds good. His mobile no. 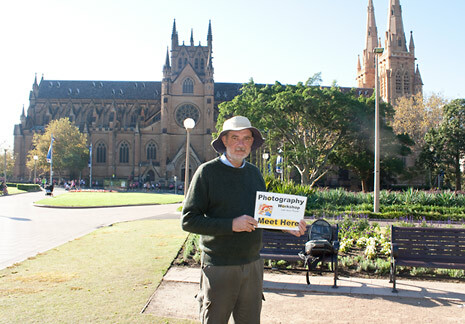 is 0410400423 and his email address is tkayser@tpg.com.au. Friend wants to join the class I am on but it is now full. We are happy to put your friend on the Wait List. Alternatively you can book a different date where there sufficient places. Please try to give us plenty of notice if you choose to reschedule so that we can fill your place. As group sizes are strictly limited to allow for personal attention it is not possible for non participants (partners, children etc.) to accompany you. Wait Lists – What are they and how do they work? Wait lists are available for all full classes. One week before a class Di sends out reminders and asks participants to confirm that they will be attending. It is very common at this stage for some people to drop out or ask to change dates. We then contact people on the Wait List to see if they are available to take the vacant spot. Is there an age limit for the classes? The classes are suitable for pretty much anyone 14 years and above. However if an attendee is under 16 years of age, I require a parent to drop the attendee off so I can meet the parent prior to the class. If you are thinking of booking a class for your child please make sure that they are keen to take part as it is important that all participants are there by choice. Most Sydney classes are conducted mainly in Hyde Park and involve only a small amount of walking. There will be a fair amount of standing but time to rest as we move through the park. We also have a break for coffee in a cafe and discuss various aspects of photography for an hour or so. Blue Mountains courses involve a small amount of walking with some steps. We travel from location to location on the 'Explorer' bus. Most of the class takes part outdoors and of course there can be a fair amount of noise in the city. Hyde Park is often on the route of parades, demonstrations and tour groups. The bells of St Mary's Cathedral also ring out a fair volume especially during the peak of the wedding season! I do often find that I am shouting to be heard. We are indoors for about an hour and we can certainly arrange for you to sit close for that part of the class. A number of hearing impaired people have done the classes and we have managed without too many problems. Feel free to call me (if appropriate) on 0448 848 864 to discuss the issue. If English is not your first language and you are worried that you might not be able to understand the classes please call me on 0448 848 864 so we can have a quick chat. If you do a class and I say something that you do not understand please let me know and I will find another way to explain. On the 1 day Sydney workshop we take a break around 1.30. As there are limited food options nearby on weekends (especially Sundays) you might want to bring a packed lunch. On the Blue Mountains classes there will be light refreshments but you might want to purchase something in Katoomba. Do I get a Certificate of attainment? If you are completely new to photography but you think you would like to become a professional photographer eventually, the 1 day class will teach you basics that all photographers need to know. Of course you will have to do a lot more in both terms of learning and practice before you consider charging for your photography. If you already know the basics and you want to take the next step towards a career in photography you should look at longer duration vocational courses. The courses run by Ultimo TAFE are highly recommended but it is very hard to get a place. Where is the remote control for the television? All the instructions are on the Gift Certificate order form. <Click Here> to go there now. I have been given a gift certificate, how do I book a course? First check available dates Here. Then click through to the booking form on the page for the course that you have a certificate for. I have a Certificate for a Half-Day class can I pay to upgrade to the 1 day? Certainly. Just book a 1 day class using the booking form and mention in the comments section that you want to upgrade from the Half-Day to the 1 day. You can of course upgrade to the 2 day course from either the Half-Day or 1 day workshop, just use the booking form for the class you want to attend. If you are unable to use a gift certificate that you have been given we will allow one of your family or friends to use it instead. If I do not want to do a class is the Gift Certificate refundable? No, we do not give refunds on Gift Certificates but a friend or family member can use it instead. How long are GCs valid?